Now that the NBA Finals are over trade rumors are all over the place, most purely speculative. It’s what us fans love to do in the off season. 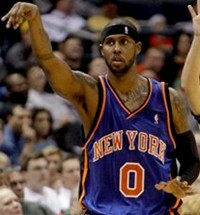 The hot topic today is the possibility of Houston Rockets guard Tracy McGrady becoming a member of the New York Knicks. The rumor first started on DraftExpress.com where they talked about the Rockets interest in moving McGrady. The problem of course is his salary, he’s due $23.2 million in 2009-10. So naturally they mentioned the Knicks as being one team who could afford that and may have interest. Alex Hahn at Newsday took that and ran with it. Don’t take that the wrong way. He didn’t say that it’s a possibility he just further explained how the Knicks could POSSIBLY be interested and how it could help the team IF they were interested. When you think about the Knicks, you think about the summer of 2010. Everything they’ve done the past few years and everything they will do this year is setting up for that. So when you see a deal like this that would keep you on pace for a Knicks record under the cap it makes you think. Hahn says a rumored deal could include Larry Hughes and the retired Cuttino Mobley. If that’s all it would take I would jump all over this deal. Hughes averaged a tad over 11 points a game with the Knicks, but who wouldn’t give him up if it means adding T-Mac? We’d lose a perimeter shooter in Larry but that’s OK as we know that an outside threat is what the Knicks are looking at in the draft. And remember even thou Tracy shifts between guard and forward he does take his fair share of three point attempts. What makes this deal even more intriguing is that McGrady is a good fit for Mike D’Antoni’s system. He’s long and lean, can run the court, shoot and best of all handle the rock. McGrady is an all-around athlete and that’s the type of player Mike would love to have in his system. While the teams interior defense would not be helped, they’d still be better overall. Like I said earlier this trade is purely speculative at the time, but it does make sense if the sides can come to agreement. If a deal were to happen I think it would happen after the NBA Draft, once both sides have a better idea where they stand. Remember the Knicks have two restricted free agents in David Lee and Nate Robinson who’ve both been involved in their own trade rumors when it comes to the draft. So till they’re situation is resolved this rumor will linger. Yeah Right, Morey wouldn;t trade T Mac for larry hughes and Mobley. Keep Dreaming NY fans. Maybe David Lee does a sign and trade.